TCWUD was conceived and developed by a group of local farmers and ranchers in need of quality potable water in the early 1970s. 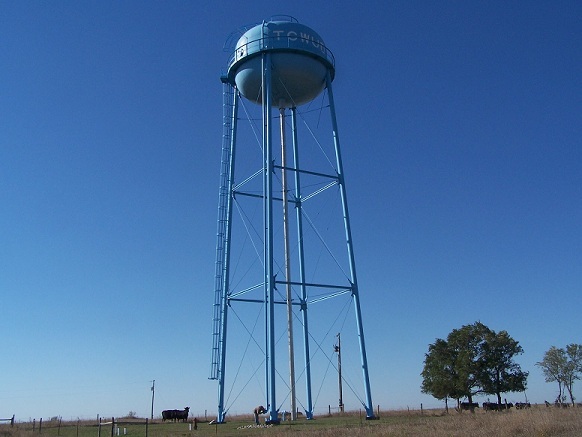 Many residents in the northern portion of Tripp County and the surrounding areas only had artesian wells or were forced to haul water for their drinking or livestock needs and were looking for alternate options. One option explored at this time was the water available south of Winner mainly in the sand versus clay. A steering committee was formed at that time. They worked many long hours and went through much controversy trying to find land to drill the first wells. After many disappointments in locating a water source, Lawrence and Sedonia Wagner were the first to allow surveying on their property, where a very high quality water source was found. So with the dedicated persistence of the committee and the help from the Wagner’s the dream became a reality in the fall of 1977 when construction began. 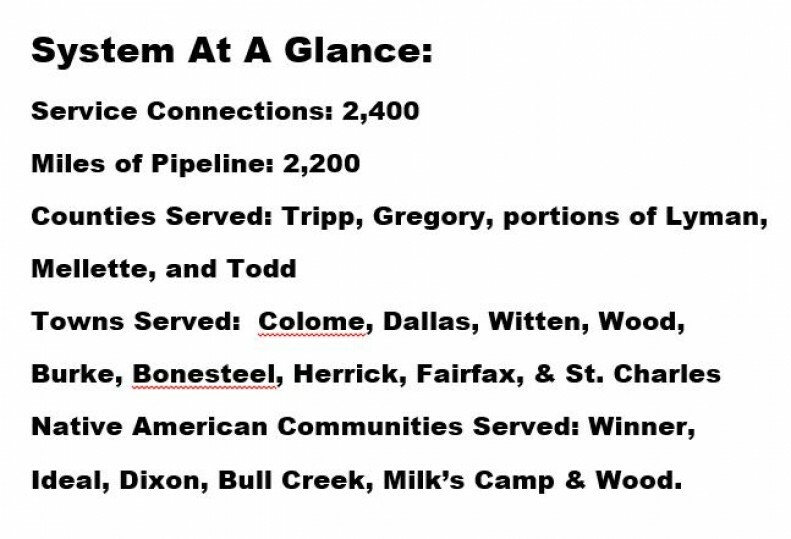 By the fall of 1978, TCWUD was in full operation, serving 515 users with 500 miles of pipeline, including one town and four Native American communities in Tripp County and portions of Gregory and Lyman Counties. The system started out with two wells that supplied 250 gallons per minute to a 500,000-gallon storage reservoir. TCWUD had several expansion projects after the main system was started, the first one in 1979 when 55 users were added with the Mellette County Expansion. In 1986, another large expansion project took place extending into the Wewela and Lucas service areas in which 230 more users were added. The 1991 and 1993 expansions, continued to add customers with the addition of the Witten, Iona and Carlock service areas. In 2003-2004, TCWUD continued to expand with the East Gregory expansion project and taking over the original East Gregory Water System in Gregory County, thus bringing the total number of customers to nearly 2000. With each expansion the system added more pipeline, tanks, pump stations and were able to serve more customers and communities quality water for their homes, businesses and livestock. The most recent expansion project was the Clearfield Expansion & Internal Upgrade Project, which was completed in the fall of 2009, expanding TCWUD’s boundaries as far as geographically possible. TCWUD continues to grow internally on a monthly basis with the additions of new customers for household, seasonal and livestock use. Towns currently served by TCWUD are Colome, Dallas, Witten, Wood, Herrick, Fairfax, St. Charles, Burke, Bonesteel and, when needed, Gregory. The system also supplies water to six Native American communities: Winner, Ideal, Dixon, Bull Creek, Milk’s Camp and Wood. TCWUD also provides water to the Buryanek, Whetstone Bay, South Scalp Creek, Burke Lake, Randall Creek and South Shore Recreation Areas. TCWUD’s high-quality water comes from the Valentine formation of the Ogallala Aquifer and only requires gas chlorine and liquid fluoride treatment which is regulated by the state. Presently, TCWUD has six active wells and main storage capacity of 2 million gallons. On average, the system produces between 1.4 to 1.7 million gallons of water per day and the well field has the ability to pump up to 2600 gallons per minute. TCWUD won the Best Tasting Water Award in 2007 and in 2009 and just missed winning in 2010. The District and Water Operators are recognized yearly by the South Dakota Department of Environment and Natural Resources with a Certificate of Achievement Award for meeting the requirements of providing safe drinking water to the public. Tripp County Water User District office is located in Winner and has six full time employees and an 9-member Board of Directors which currently serve the District. TCWUD’s original office was located at 130 West 4th Street in Winner for many years. In 2004, the District purchased the old Miller Brother Building on the west edge of Winner, which was mainly used for the storage of vehicles and inventory. The Board and staff thought it would be best to have one general location, so in 2006 the plans began to remodel the vacant showroom portion of the District’s other building. In April 2007, TCWUD moved into their new office at 1052 West 1st Street on the west end of Winner. The Directors and employees have enjoyed the added space and convenience of the new location.